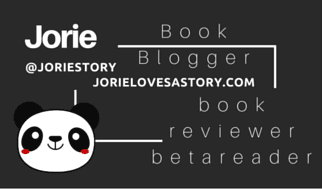 Book Review | “Pieces of Granite” (Prequel, Coming Home series) by Brenda S. Anderson Jorie happily returns to a series that touched her heart! Acquired Book By: I answered a call to become a member of Ms. Anderson’s Author Street Team which was posted on her blog in March 2014. She accepted me as part of her Street Team, whereby I am one of her early readers who has the opportunity to read her novels a bit ahead of their published release or just after their release date, whilst finding ways to talk about why I love reading her novels on my blog and Twitter feeds. 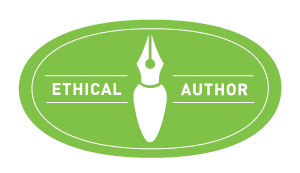 I truly love championing her collective works as she’s writing wicked good INSPY fiction for today’s modern reader. I re-affirmed my commitment to her Street Team in July 2016, as I never truly left but my participation was on hold until this Summer. Most of my participation between 2014 and 2016 occurred on Twitter; you can still find my tweets threading through the twitterverse about the Coming Home series! When Ms. Anderson says she writes ‘gritty fiction’ she is referring to the fact she likes to dig deeper than the superficial layering of telling a story. She likes to go directly into a character’s soul and walk of faith, rooting out their emotional and psychological stability or instability if the case might be, in order to best show the growth and spiritual awakening they need to embark towards. For some it is a spiritual renewal and for others, it’s an awakening because they never gave themselves the proper credit towards understanding God in the first place. She breathes honesty and raw emotions into the context of her stories, and her vision for her characters is realistic humility in recognition of everyman’s faults, fragilities, and sensitivities. She organically digs deeper to tell a more compelling and openly captivating story which pulls you in from page one and does not leave your heart even after the last page is turnt; the story fully absorbed and known. She is most definitely an emerging voice in Inspirational Fiction to keep an eye out for new releases and a finger-tap on interlocking book series! She maintains the spirituality of Christianity in a gentle way of allowing you to oversee the character going through the motions of returning to a God-centered life which is cross-referenced by light commentary of scriptures and affirmations of God’s grace. It is through the lessons of her character’s actions that the greatest arc of spirituality is found. I realise Ms Anderson softens her approach to writing the tone within the Where the Heart Is series which follows publication after the Coming Home series – however, what personally tethered me to her writerly core of heart initially was how honest she was to write an emotionally raw and convicting story-line about wicked real characters who were struggling to find a bridge through adversities and life-changing moments erupting through their ordinary hours. They were in the midst of changing who they were internally as much as spiritually – re-awakening themselves to mercy and forgiveness. Her cardinal approach to cut a slice of life affirmative fiction into our readerly hours is a lift of joy to me as a reader, as these are the kinds of stories I love to find within the realms of today’s Contemporary INSPY! I also love how she follows her heart, penning stories that are a firm step outside the box of where Inspirational Fiction has the tendency to become a bit too predictably stagnant and re-writes how all INSPY writers can find fuller freedom in painting a portraiture of our everyday world. When you first set out to write the Coming Home series did you envision each individual book in the series or has the series knitted together organically one story at a time? Anderson responds: When I first started writing, I had no clue that I would end up with a four book series. Each book grew organically from the previous. I first wrote Chain of Mercy and realized that I actually had two stories in one, so that’s how Memory Box Secrets was born. The story expanded from there. Pieces of Granite came about because I kept hearing from agents and editors that female readers didn’t want to read a book about male issues, so I decided to create a story from the female perspective. In Chain of Mercy, the hero (Richard) talks about a fight he’d had with his younger sister (Debbie), a rift he created when Debbie told him about her daughter having Down syndrome. I took Debbie’s story and expanded it. I wrote Finding Home because I left a few loose threads dangling at the end of Memory Box Secrets (that’s all the spoiler I’ll give!) I needed to address those threads properly. I initially intended to read and review the books as they were releasing as an active member of the author’s Street Team, however,  proved to be quite the difficult year for myself and my family. As previously reflected on my End of the Year Survey, 2015 – I even garnished a bit of a backlogue of reviews and titles I was seeking to read. I elected to focus on the stories I was able to read and remained hopeful the tides would turn to where I could reclaim the stories I was not yet able to greet against the page! Thus, as 2016 started to unfold, I was hoping I could arrive inside a moment where I could lay heart and mind back inside this beautifully conceived Realistic INSPY series as my first reading of Chain of Mercy was such a powerful one, I was drawn immediately inside the vision Ms Anderson had for the series as a whole! I knew from that one reading, I would be forever grateful to be amongst the readers who not only sought out her collective works but could continue to find out what she drew together for these characters I had become so dearly attached too knowing more about! It so happens, this Summer I felt was a renewing season for myself as a reader – where I could not only dig back inside the stories on my bookshelf I longed to soak inside but I could pull together stories on parallel themes that truly touch my spirit and heart as I am reading them. Be sure to watch for my upcoming reviews on behalf of stories of mumhood & alternative families: Claiming Noah by Amanda Ortlepp this July, followed closely by Ignoring Gravity by Sandra Danby, Dear Carolina by Kristy Woodson Harvey and Inconceivable by Tegan Wren in early August. As together with Pieces of Granite I am reflecting on all aspects of being a Mum and how family enters our lives whilst grounding us on a path that is a true blessing to be given. Notation on Cover Art: I personally love how Ms Anderson was able to get synchronicity and harmony with her cover art designs for the Coming Home series – she truly found designers who knew how to create a certain textural feel to the undercurrent thematic of the series but also, the level of hope within any story writ under the INSPY umbrella. I felt collectively they are an incredibly layered series creatively etched to mind through their covers and the choices wherein the story-lines are represented. who is left to be strong for her? Brenda S. Anderson writes gritty and authentic, life-affirming fiction. She is a member of the American Christian Fiction Writers, and is currently President of the ACFW Minnesota chapter, MN-NICE. When not reading or writing, she enjoys music, theater, roller coasters, and baseball (Go Twins! ), and she loves watching movies with her family. She resides in the Minneapolis, Minnesota area with her husband of 28 years, their three children, and one sassy cat. Her debut novel, Chain of Mercy Book #1 in the Coming Home series, came out in April of 2014. Pieces of Granite the prequel to Chain of Mercy was a semi-finalist in the ACFW Genesis Awards released on November 18, 2014! Acquired Book By: I was approached by iRead Book Tours to host another non-fiction title “Life Outside the Box” (which is upcoming on 22nd of June) prior to finding “Return to Food”. I decided to start hosting regularly with iRead Book Tours and their companion hosting company Italy Book Tours as a direct result of how welcoming they are to book bloggers. 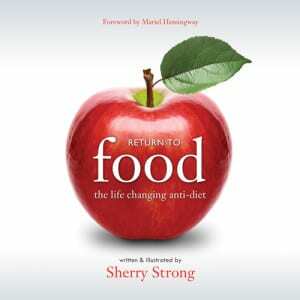 I received a complimentary copy of “Return to Food” direct from the author Sherry Strong in exchange for an honest review. I did not receive compensation for my opinions or thoughts shared herein. One of the best blessings to opening Return to Food was being greeted by the author’s own artwork on the illustrative plates which coordinate and cross-reference her messages throughout the book. My favourite illustrative plate is on page 3 which shows a portrait of a teenager and is talking about how teens can become unhealthy simply by the choices they are making in their diets. A fact I could relate to myself, as my school years were not my favourite years for eating as I found the time allotted for lunch was too rushed and only focused on getting us in/out of the cafeteria without any consideration for the time needed to consume the food we were eating. It was the first taste of the crazy rat-race of corporate America and the internal harried clock of the working man, because many professional careers do not allot a lot of time for meals much less for a persona life. Hence why this first illustration struck a chord with me, and I knew, having seen how she surrounded the graphic with words clarifying the key issues, that most of our downward spiral of unwellness due begin and start in childhood and/or adolescence. The one thing I wanted to share as I was reading Return to Food is how I’ve never sought out a ‘diet’ per se but rather a lifestyle of eating that would allow my body to thrive in a way that was not co-dependent on foods which would only deplete my health and thereby, reduce the nutrition that I could have yielded if I had eaten foods differently. I have been on a quest for most of my life to source out the best way to balance food and the combinations of foods which would agree with my system. As for each person who is seeking a healthier lifestyle, we all have to remain mindful of what works for us and how to tap dance around allergies or other afflictions that make transitions a bit trickier than those who do not have them. As I relay my experiences reading cookbooks inasmuch as hosting author guest features by the chefs or authors behind the books I am reading on healthy eats across the divide of where savoury and ambrosial meet each other in harmonic blissitude, I am hoping that perhaps something I am sharing about my own journey will resonate with other readers who are seeking a similar path. Underneath my blog posts are related posts which can give you a quick-step glimpse into where my wanderings as the Bookish Foodie have led me to go thus far along, inasmuch as you can scout out the cookbooks directly in either my Story Vault or my Publisher’s Story Vault (hint: scroll down to Cedar Fort’s imprint Front Table Books). As you will find as you wind your way through my showcases on food, I have a penchant for whole foods, living foods, and a quirky attachment to gluten-free vegan baking! I personally love to eat vegan foods as much as I delight in the joy of fresh veg juicing with greens. A green smoothie to me is heavenly bliss and beet juice with a fusion of carrots, ginger, & other bits is a refreshing jolt of vitality. I don’t have to have a traditional plate of food in front of me to be happy because I have been on a journey towards living my inner truth of joy for over a decade now. I personally would love to become 100% vegetarian seeking out gluten-free and vegan compliments as often as I could. I love to eat by the seasons and I look forward to getting back to a simpler way of re-routing a food map which includes staples of must-haves that can co-relate and compliment other ingredients on a regular basis. At the moment I’m an omnivore whose missing her herbivore days, but each of us is on a path that we must walk in order to get to where we’re going next. I don’t hide the fact I had to give up the herbivore lifestyle nor my quest to return back to where my own spirit thrived in the bliss of local farm fresh fruit and veg. I appreciate the dedication farmers are giving back to us as consumers, to where we can purchase fresh off the farm vegetables at farm stands and farmer’s markets or the new hybrid of the two: a you pick it yourself farm where your salad greens and your kohlrabi are practically kissing cousins! Laughs. Being able to find ways to understand the distance my food is travelling to my plate is important to me, especially in the world of Big-Ag and the propensity for creating fast food on a farm that is commercially produced in ways that I do not find ethical nor healthy. because I am already on a mission towards that end! Blog Book Tour | “To Ride A White Horse” by Pamela Ford An evoking nautical #histfic which enriches your spirit simply by the tangible ache you have in your heart as you devour it’s pages. 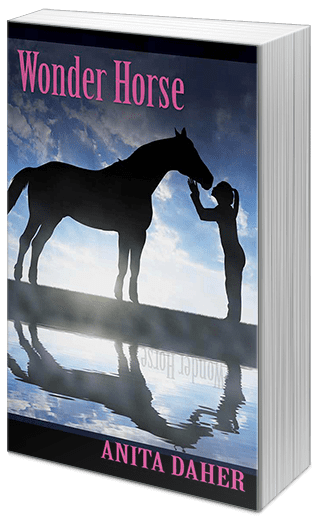 I was selected to be a tour stop on “To Ride A White Horse” virtual book tour through TLC Book Tours. I received a complimentary copy of the book direct from the author Pamela Ford, in exchange for an honest review. I did not receive compensation for my opinions or thoughts shared herein. 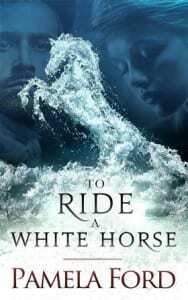 What makes the cover design for To Ride A White Horse so epic is the convergence of the two halves of the whole – you have two leading characters opposite of the horse and the horse itself is rising up in such a dramatic pose! The woman’s eyes are downcast and unseen whereas the sturdy gaze of the man and the intensity of his stare eludes to a larger whole. It is quite an evoking cover to place on a historical romance novel, but this novel’s premise is anything but typical. It was the premise itself which had such a strong sense of urgency to be read that gave me the most wicked anticipation to see it arrive by Post! I can definitely say I am appreciating the Classical Music selections on Earbits.com, as I have ducked inside the Renaissance and Classical Folk channels of music to serve as ambiance behind my readings of ‘To Ride A White Horse” as the undertone of the selections matched well with the evoking drama within the novel. Some of the selections felt a bit Irish by inspiration, even though I am most certain they were not of Irish origin (at least not all save a few), but there are similarities within music and for me, it felt quite natural to have this running in the background as I devoured the words and blogged my ruminations. Although the selections on both channels were not of my own choosing more times than naught it felt the music playing in the background were serving a greater purpose – a soundscape of this novel if you will. I shall not soon forget how aptly in-tune the selections were with the drama and the angst as it played out across the pages. After graduating from college with a degree in Advertising, Pam merrily set off to earn a living, searching for that perfect career as she became a graphic designer, print buyer, waitress, pantyhose sales rep, public relations specialist, copywriter, freelance writer - and finally author. Pam has won numerous awards including the Booksellers Best and the Laurel Wreath, and is a two-time Golden Heart Finalist. She lives in Wisconsin with her husband and children. Acquired Book By: I am a regular tour hostess for blog tours via Cedar Fort whereupon I am thankful to have such a diverse amount of novels and non-fiction titles to choose amongst to host. I received a complimentary copy of “Ally’s Kitchen” direct from the publisher Front Table Books (imprint of Cedar Fort, Inc) in exchange for an honest review. I did not receive compensation for my opinions or thoughts shared herein. Any traveller will lament the same as I have recently, the best part of experiencing a culture is through their food. When you travel to a different country (or even a different city, province, or region of your own) you have the chance to spend a particular amount of time experiencing the spice, the flavour, and the essence of what makes that particular place in time a riveting adventure of the senses by trying foods which might take you outside your comfort zones! Food has a language and courtesy of insight in of itself – food by definition is a living spirit of communication by giving us an editable road map into traditions and culture where the ingredients speak the words of historical artifacts of a person’s life. I love seeking out foods from other places – both as a visitor on a holiday journey or as a foodie who wants to try a new method of cookery delight by walking into a restaurant serving dishes made with ingredients and spices not as well-known to my palate until I become introduced to them on the plate! I love the excitement of eating something that not only has smelt delish as it arrives on the table but visually it is a curiosity of origin and of taste. Seeking out new ways to put ingredients together inasmuch as how complimentary veg and other components in a meal can come together to create a wicked new experience is part of the joy of exploring culturally enriched foods and the traditions of how food can become transformed simply by using a different approach to placing them inside a meal. Dr. Phillips wasn’t kidding when she said you’ll take a culinary adventure with her cookbook – by the first moment I stole a glimpse inside this beautiful hardback collection of journal entries and recipes, I knew I was in for a lifetime of wanderment to seek out the ingredients I would need to re-create the meals within! She tantalises your curiosity by selecting stories to share which are co-dependent on the dishes themselves to reveal a piece of who they are and who you are as you consume them. Experiencing food in this way encourages my own spirit to soar because I love being able to step outside something my own family might consider traditional (although technically speaking, I have a melting pot heritage so what is deemed ‘traditional’ by our standards isn’t quite akin to someone else’s family!) and find a new vitality in embracing the foods of the world! If you missed my journalling about Mexico, be sure to read about my memories of the country and the cuisine before you leave today! As you will understand a bit about what I am referencing as I share my thoughts on Ally’s Kitchen! Ally's Kitchen: A Passport for Adventurous Palates! Great flavour knows no boundaries! After years travelling the globe, popular food blogger Ally Phillips has tasted almost everything. Now she's bringing you the best eats the world can offer in a one-of-a-kind cookbook that shares recipes, meal ideas, and entire cultures. Whether you're in the mood for something tantalizingly unique, like Jerusalem Eggs with Forbidden Rice & Quinoa, or comfortingly familiar, like Picasso Belgian Waffles, this book lets you wander the world without ever leaving your kitchen. With ingredients you can find anywhere and easy-to-follow instructions, these recipes will bring the world's favourite foods to your dining table so you can impress all your friends and family. Fresh, vibrant, and full of life, this inspiring collection of global recipes is guaranteed to turn your ordinary meals into memorable masterpieces. Dr. Alice D' Antoni Phillips, fondly known as Ally, grew up in "the hollers" in West Virginia dreaming of faraway places. Now she visits exotic locales both personally and virtually on her well-travelled magic carpet. Whether she's on stage, on location, or in the kitchen, Ally captures the essence of each experience - new foods, spices, and lifestyle tips - to bring them into her home and yours. Ally delights in dreaming up recipes on her yoga mat and transforming everyday objects into treasures.